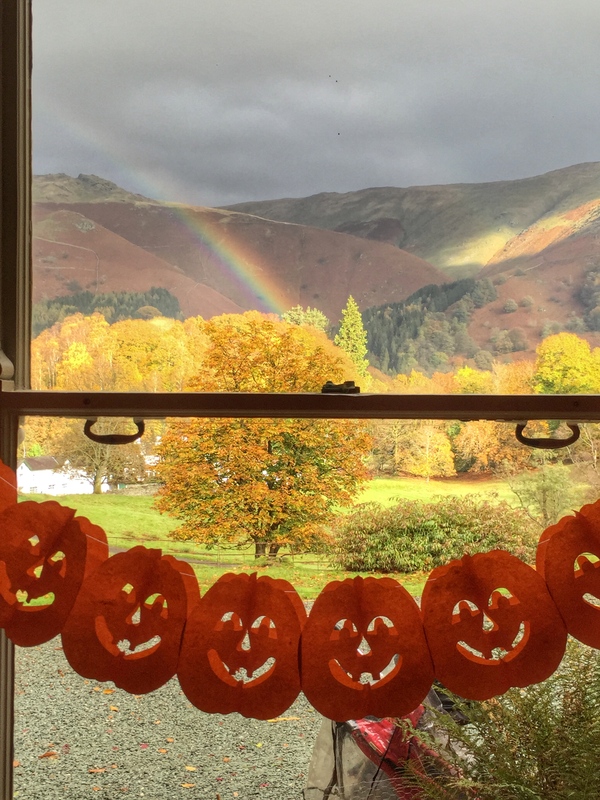 Grasmere Rainbows, Autumn, and Halloween. 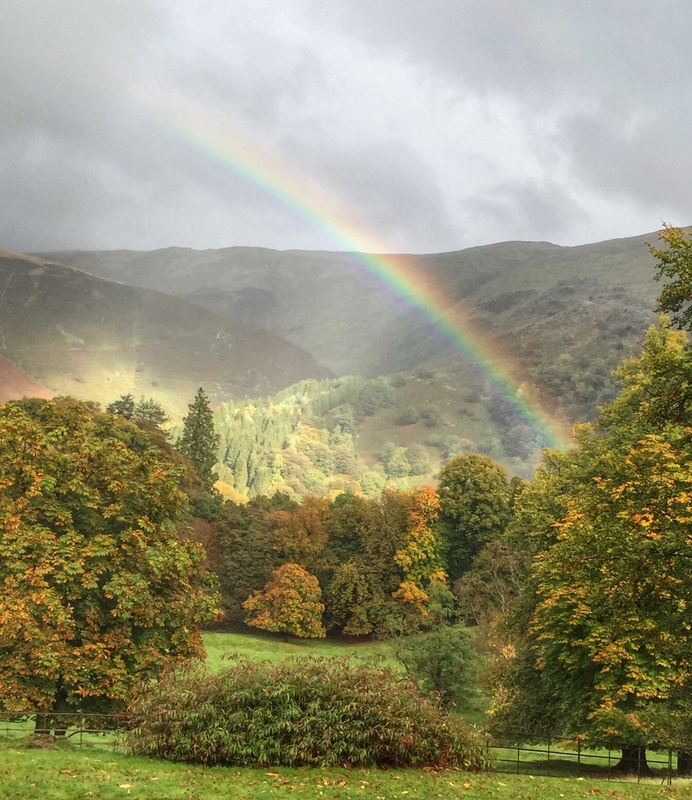 October in Grasmere has been an amazing month for rainbows. The beautiful weather we had over the summer has led to sunshine and showers and with the showers, rainbows. Lots of rainbows! Early morning has been beautiful too. Great cloud inversions looking towards the mere. and once the clouds dispersed a little, wonderful reflections. 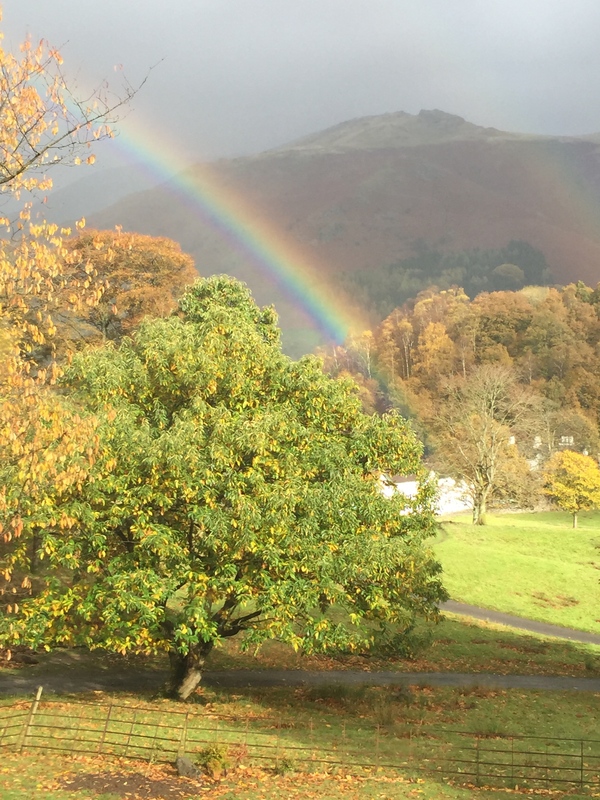 October in Grasmere also means Autumn Festival and thoughts of Harvest. 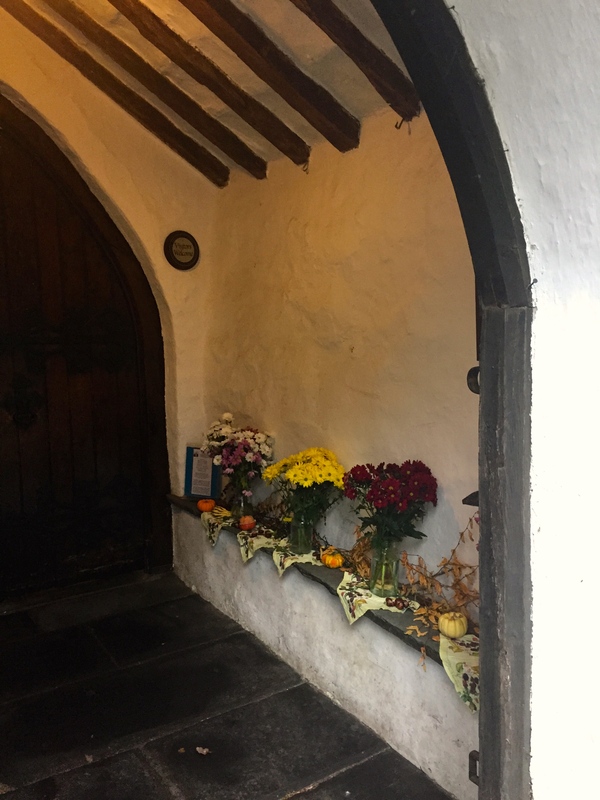 It was pouring down this morning but this display in the entrance to St Oswald’s Church brightened up the morning. Crossing the road at Church Stile I noticed the National Trust shop was looking very Autumnal too. 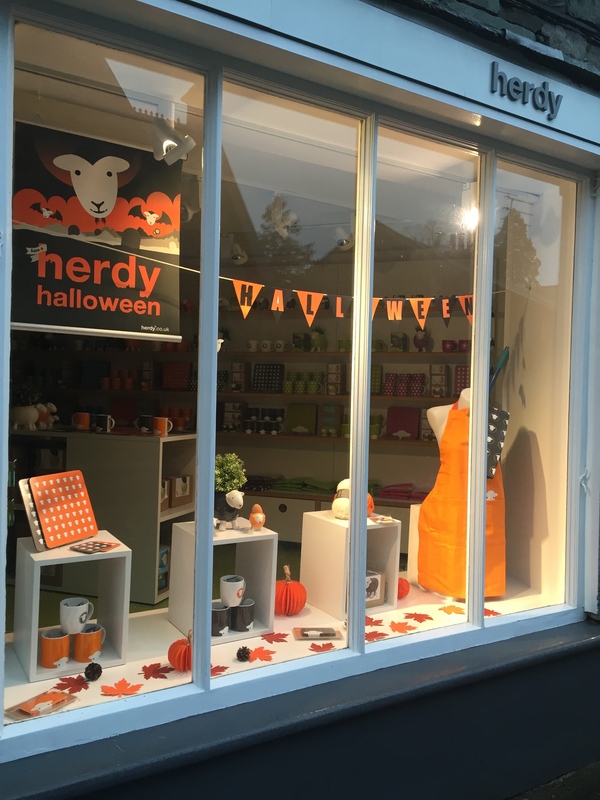 Halloween is also fast approaching and in College street the Herdy shop was brightening up a rainy day. 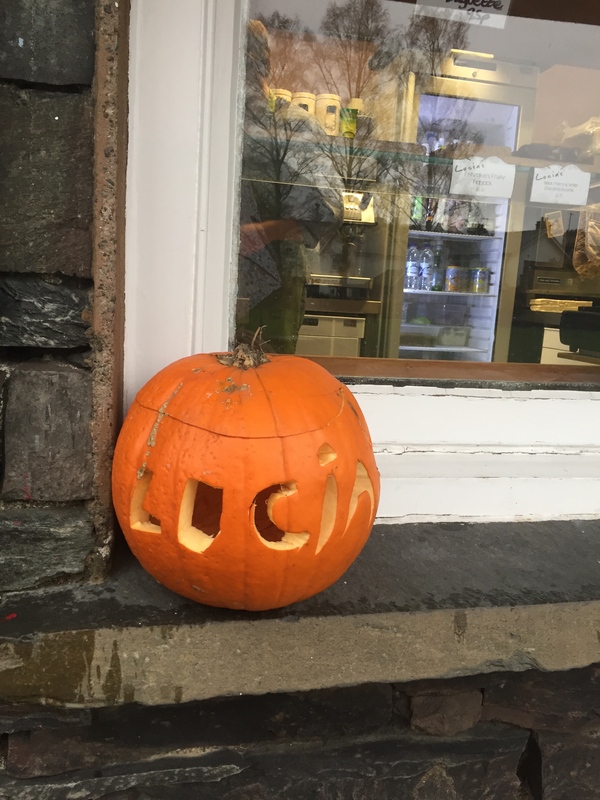 Lucia’s Takeaway had been busy with their own personalised pumpkin. 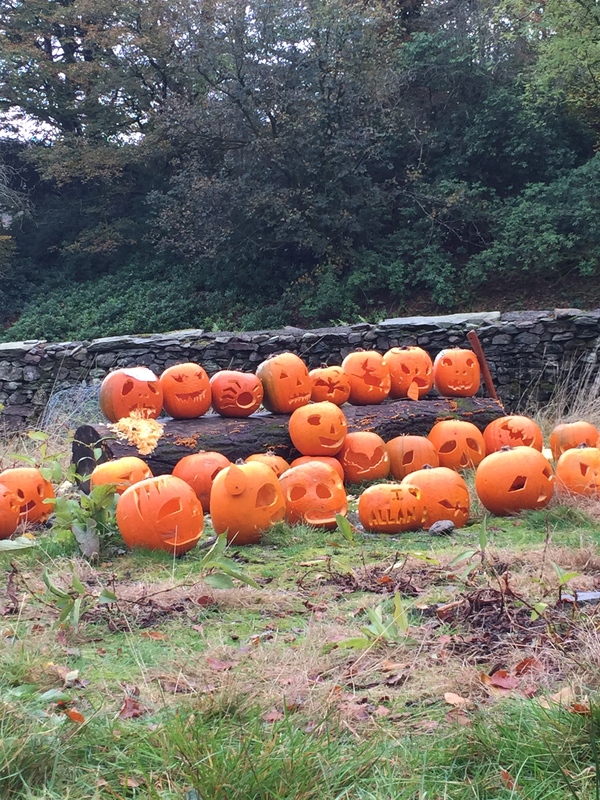 and at National Trust Allan Bank it was pumpkin central as they were having a pumpkin trail over the half term holiday. 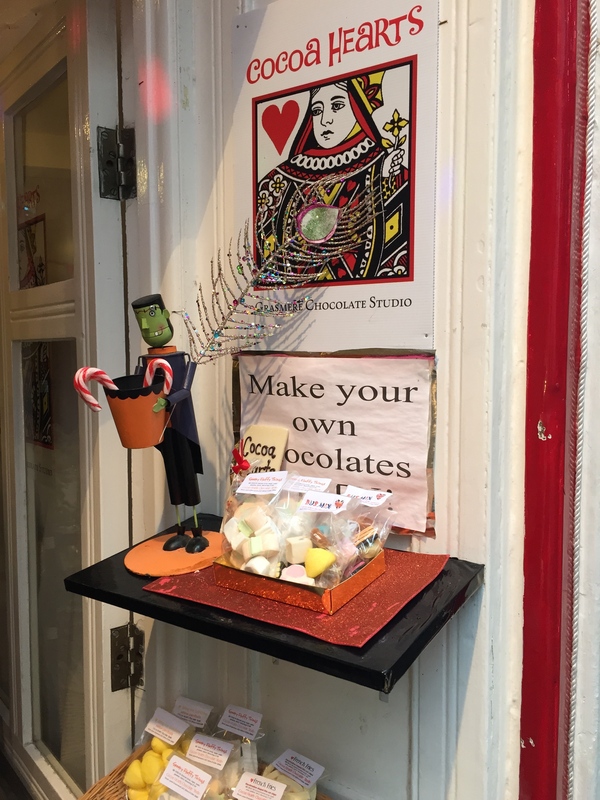 Cocoa Hearts chocolate shop had lots of people sheltering from the rain making chocolates to take home. 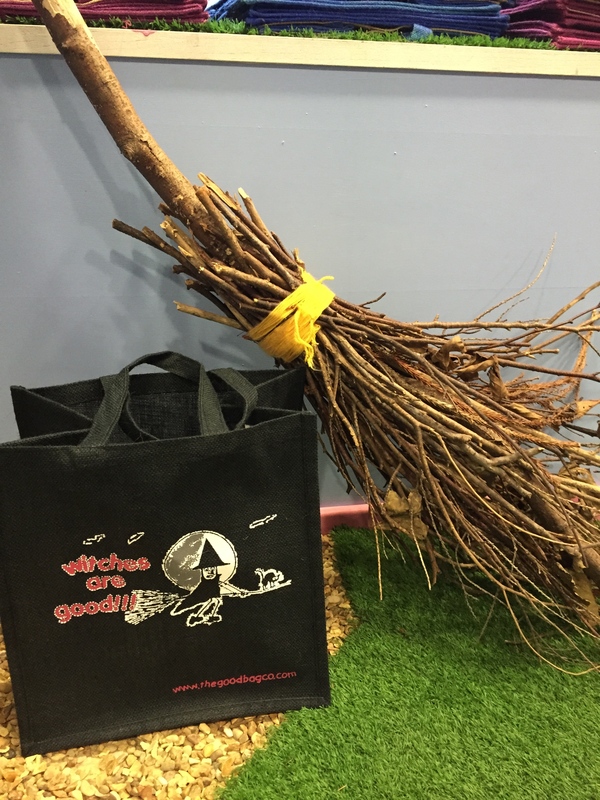 and a witch seemed to have taken up residence in the Good Bag shop next door. 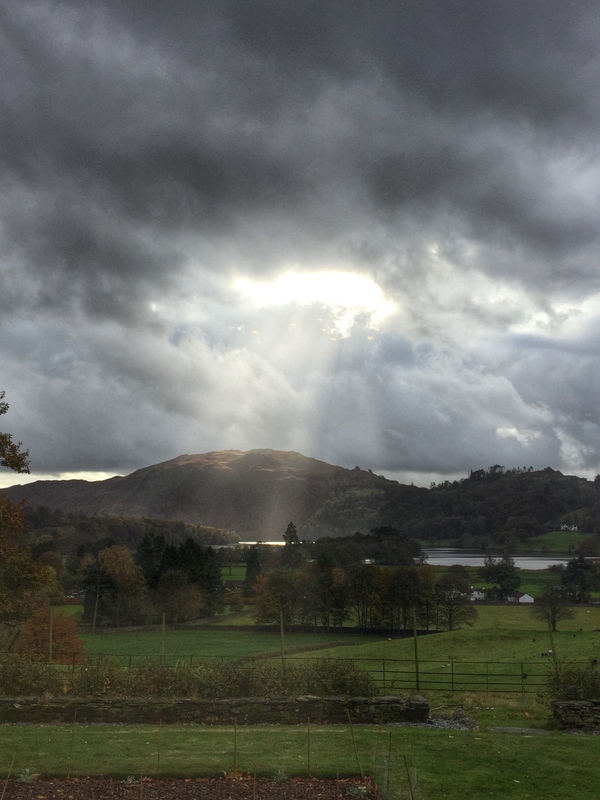 So despite the rain, Autumn is a great time to be in Grasmere, and when the clouds part…..
the views can be truly spectacular. So keep an eye open for rainbows, and Happy Halloween everyone. 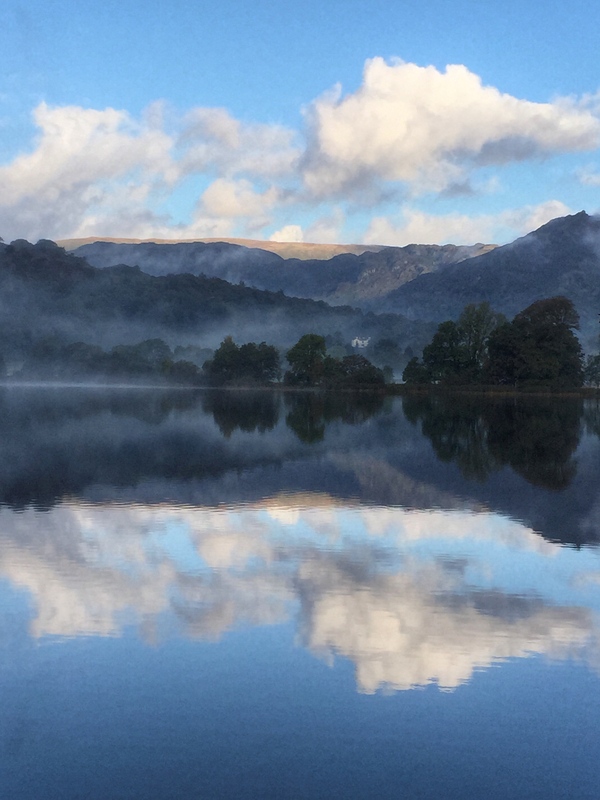 I always feel proud of Grasmere, but never more so than this morning. On my early morning walk there was a sign saying “use side entrance of church” so I did!. In all the years I have been here, I have never seen such a sight. 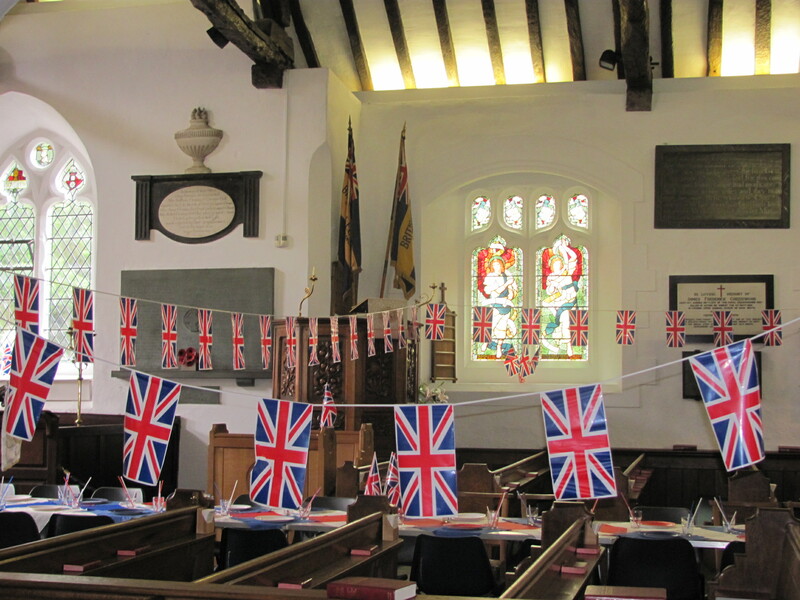 The interior of St Oswald’s Church was all decked out for a Jubilee Party. 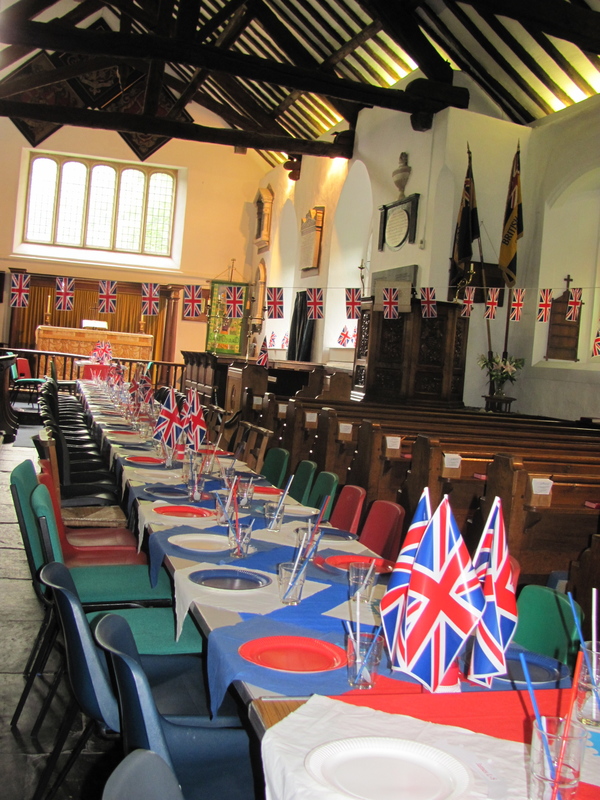 The lucky children of Grasmere School were having a “street party” inside the church. Something they would no doubt remember for a long time. Each child’s name was made into a crown, and the scene was set. That got me thinking. 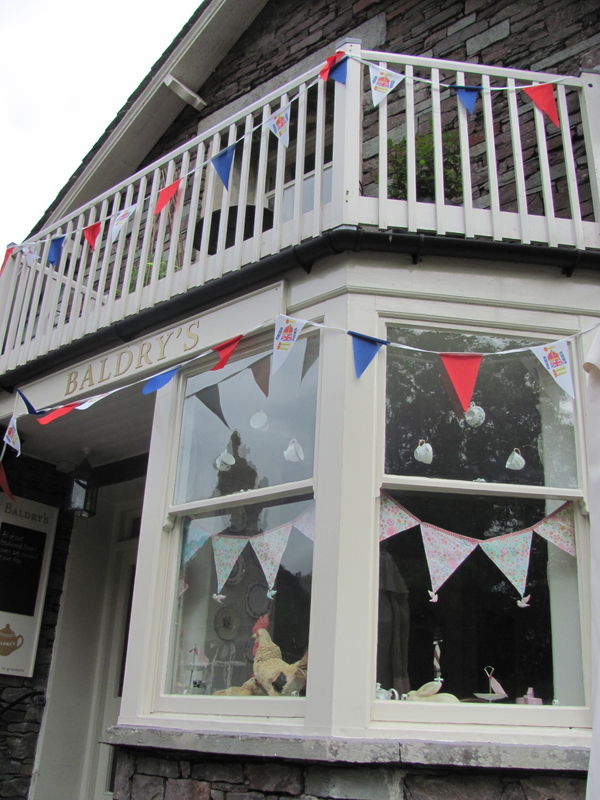 Why not photograph more of the businesses that had made an effort for the Jubilee. So here we go. All credit to the following for making things so nice for our visitors. 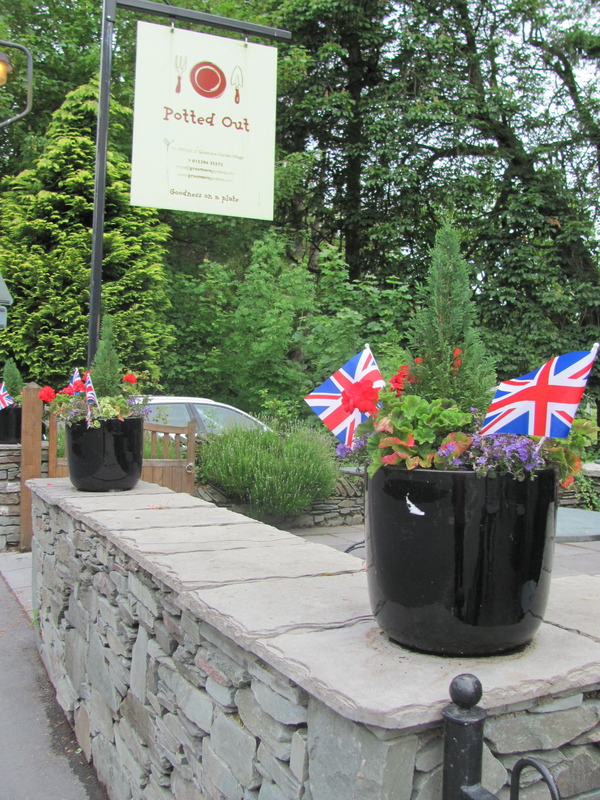 Potted Out Cafe had the flags flying over their door, and also these displays in their plant pots. Well they are part of the Garden Centre after all! 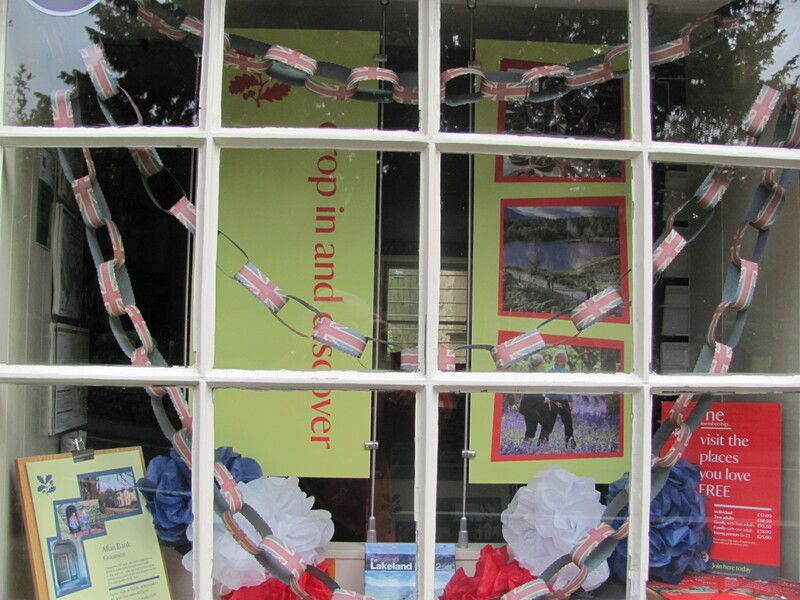 All Red, White and Blue in the Information Centre Window. I think Sarah Nelson would have been very proud of the display the present family members had made of the Gingerbread Shop. 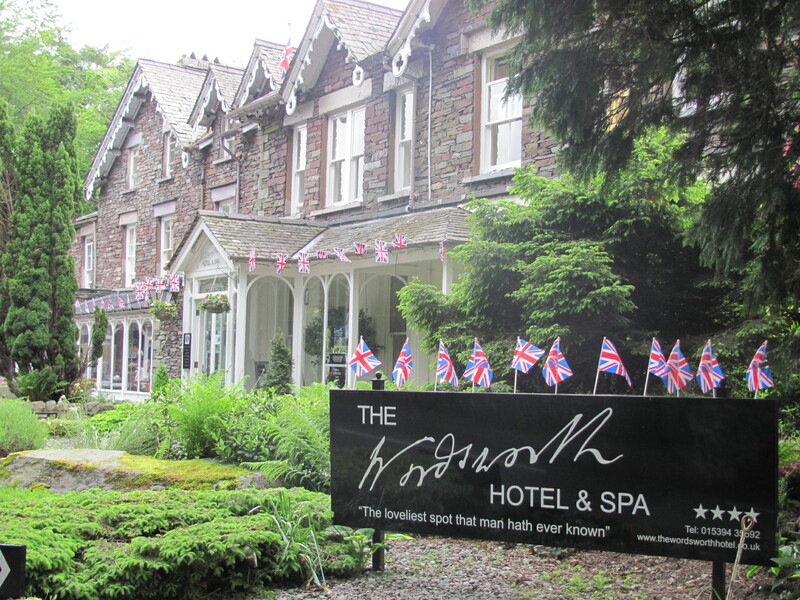 Next up, The Wordsworth Hotel. Nearly got lead astray at this point as I could see everyone in the Hotel restaurant tucking into their breakfasts, which looked delicious! 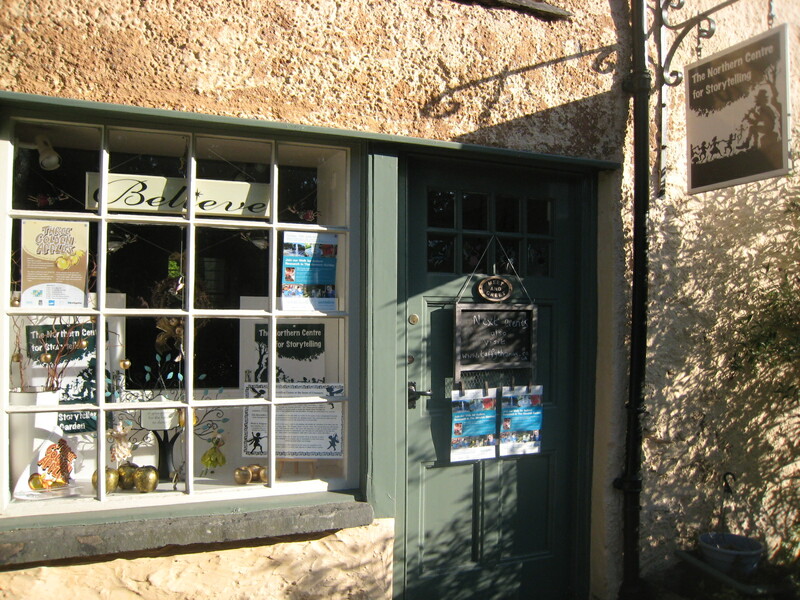 Luckily Baldry’s Tearoom was shut, as they have the most yummy cakes you can imagine. 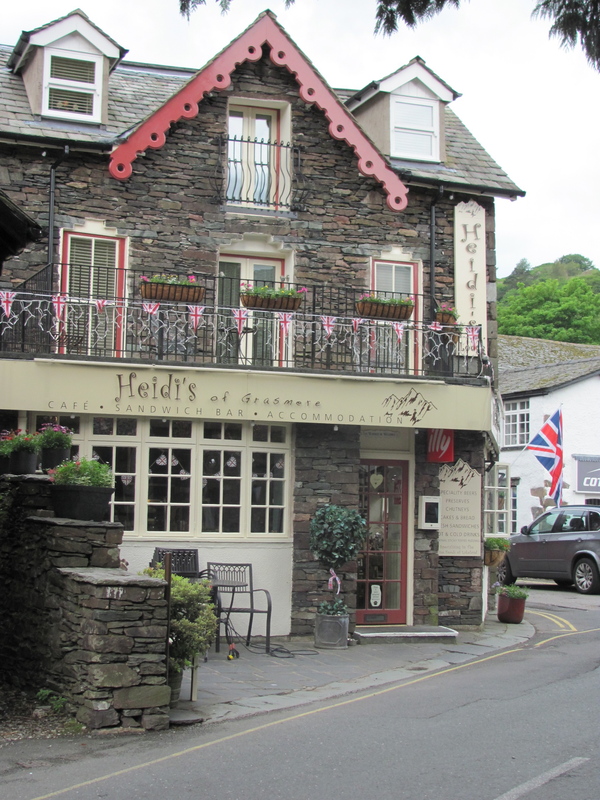 The flags were flying at Heidi’s Cafe. A great place to stock up on a packed lunch for your walk. 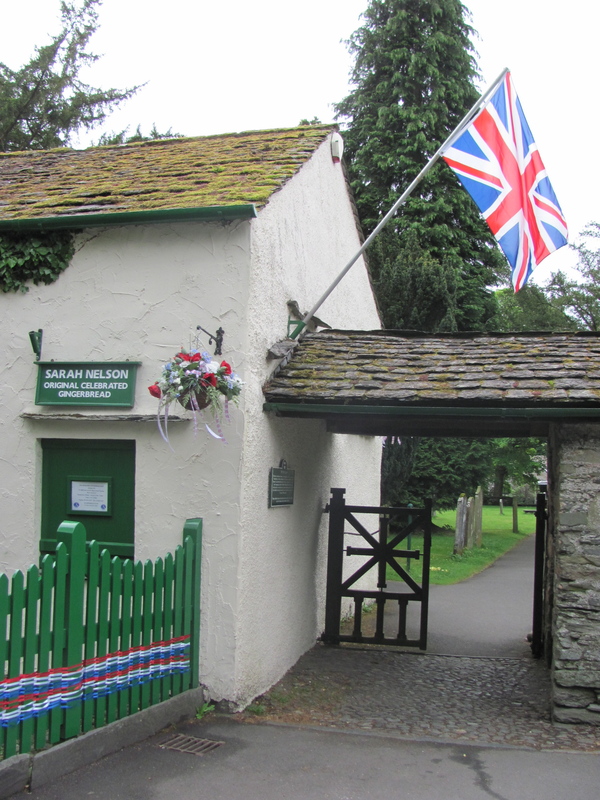 One of the oldest buildings in Grasmere. 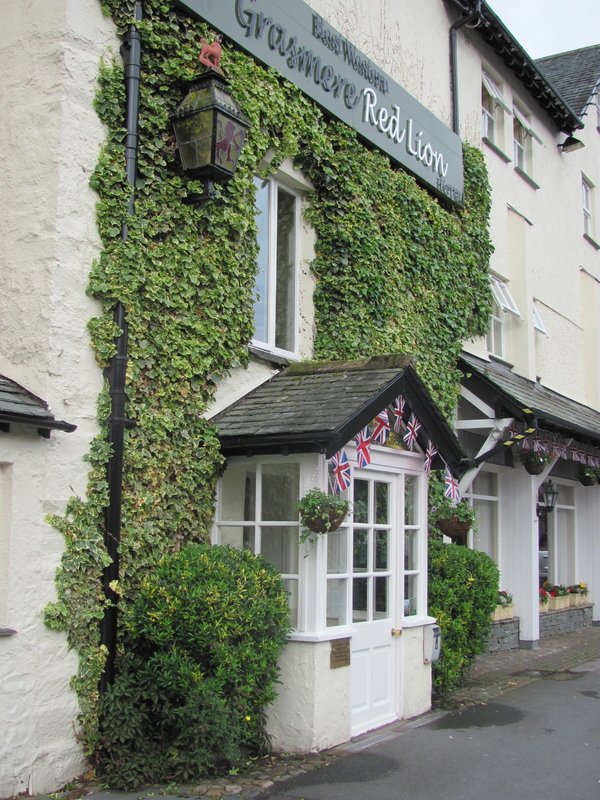 The Red Lion Hotel. And the newest shop, just opened in a new home. Attic, full of wonderful gifts. 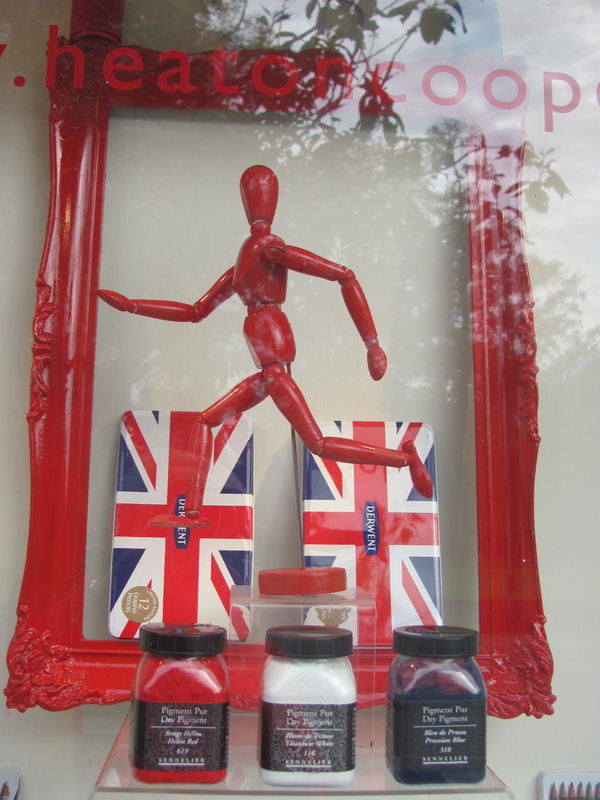 Loved the Heaton Cooper Studio window. Obviously making the most of the fact that we also have the Olympic Torch passing through the village as well. 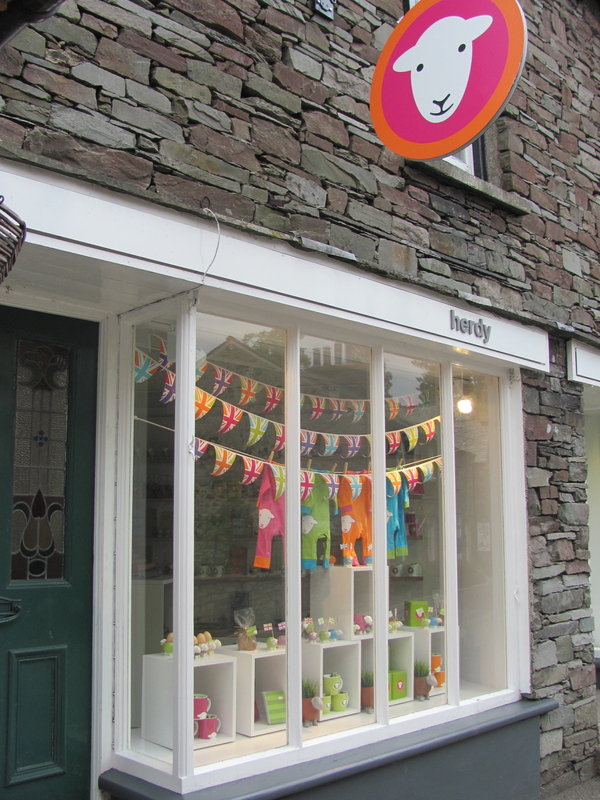 Everyone’s favourite the totally cute Herdy shop. A great base in the centre of the village. 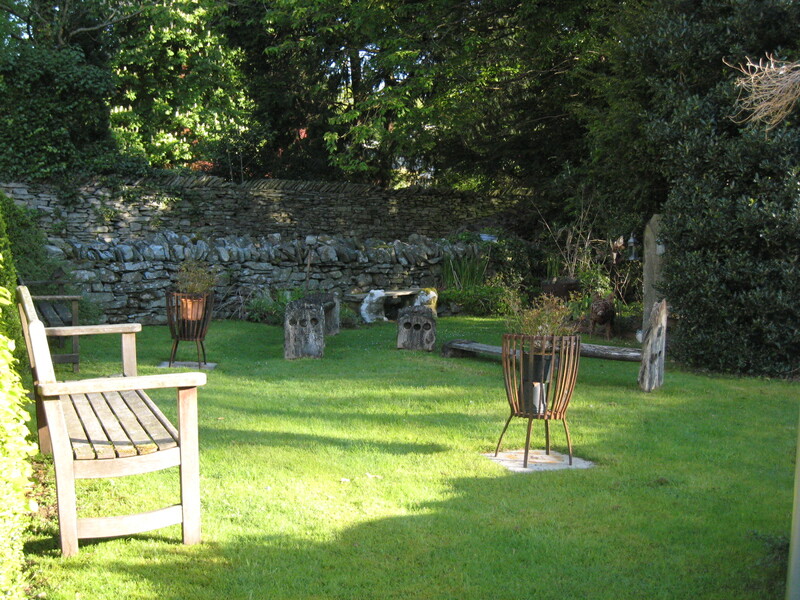 Beck Allans holiday cottages and Bed and Breakfast. I suppose it was inevitable that the Storyteller Laureate of Great Britain would have the flags flying. And guess what! Storyteller Taffy was at home. 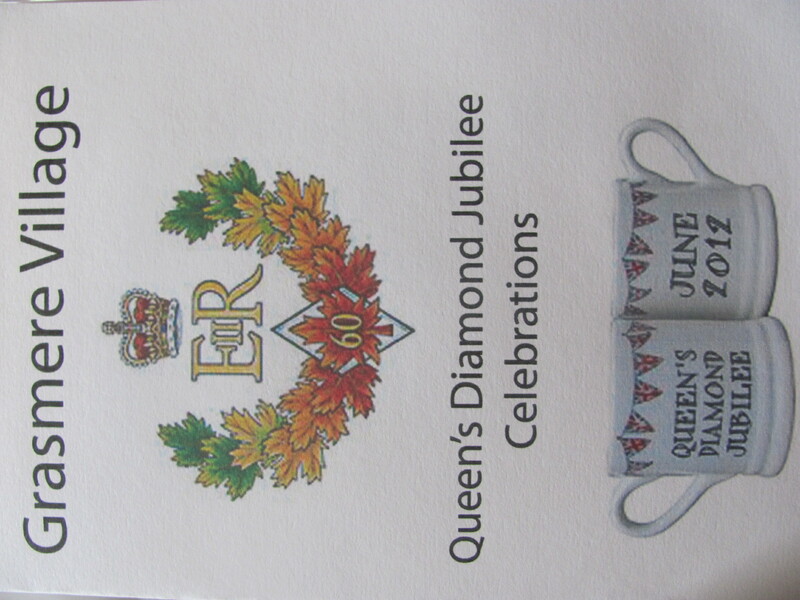 Full of tales of the events he was holding over the Jubilee holiday. 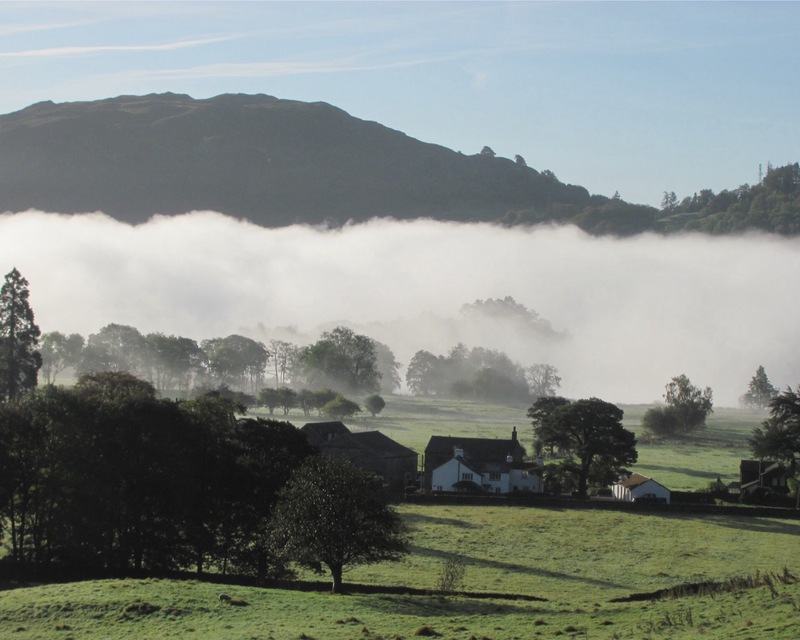 In his newly spruced up garden, and as part of the Tales and Trails season, which take in walks to Helm Crag and Rydal Water. He was also telling me about an event he is appearing at, at the newly re-opened Allan Bank. 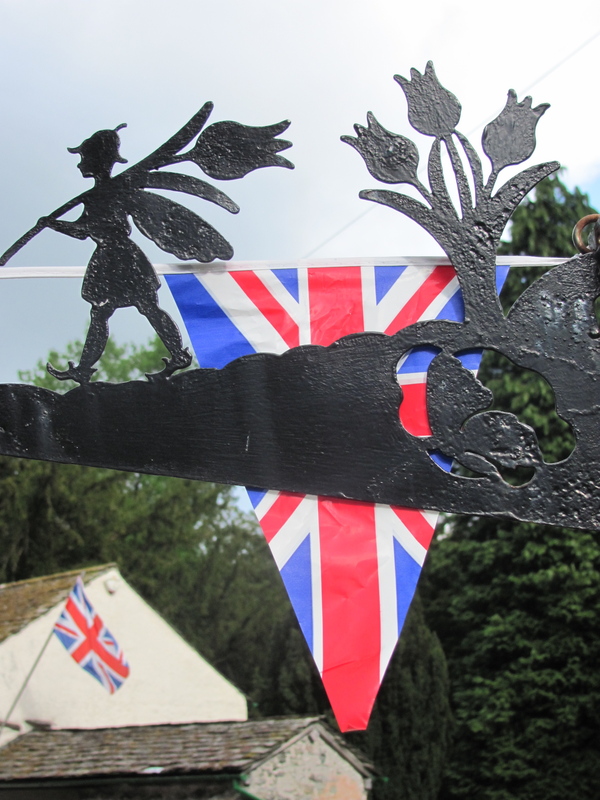 An evening of fairy stories and music for mid summer. Sounded great. So there you have it. 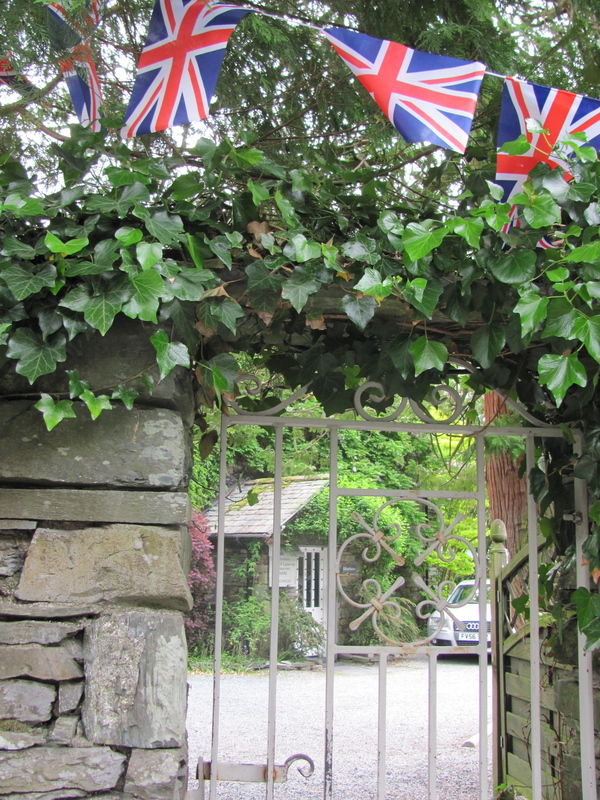 A little insight into Grasmere life. With events planned all over the 4 day holiday, it’s a great place to be. 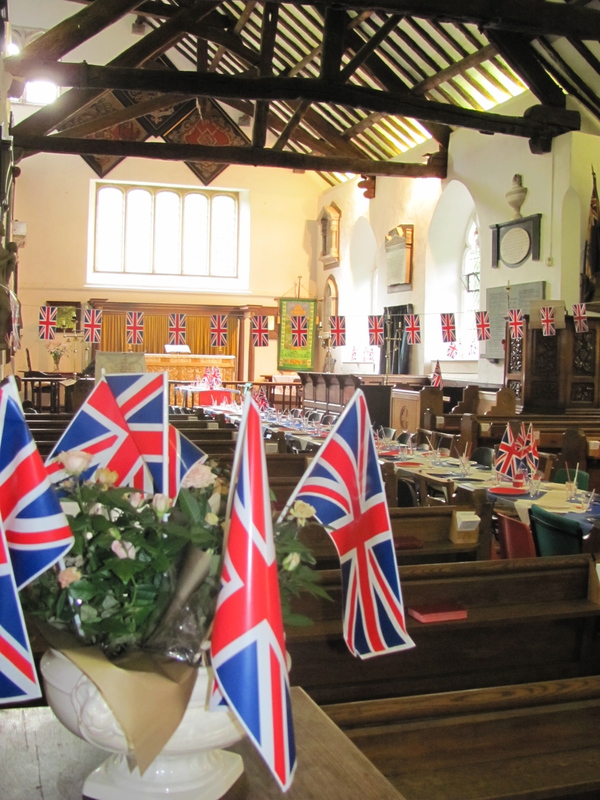 Hog roast, sports, concerts in the church and a beautifully decorated village. What more could you ask. 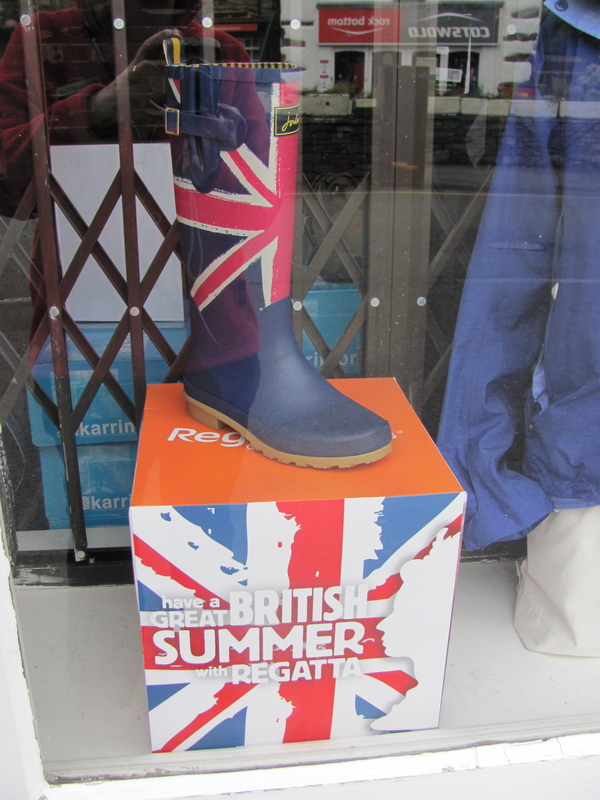 Finally, come rain or shine, I spotted these in an outdoor shop in the centre of the village. You too can be patriotic come rain or shine! 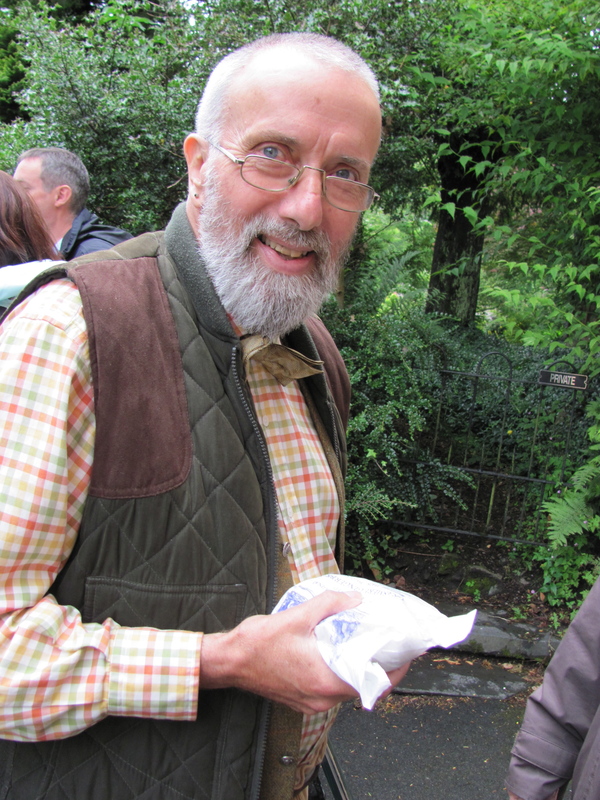 Taffy Thomas MBE Grasmere Storyteller. 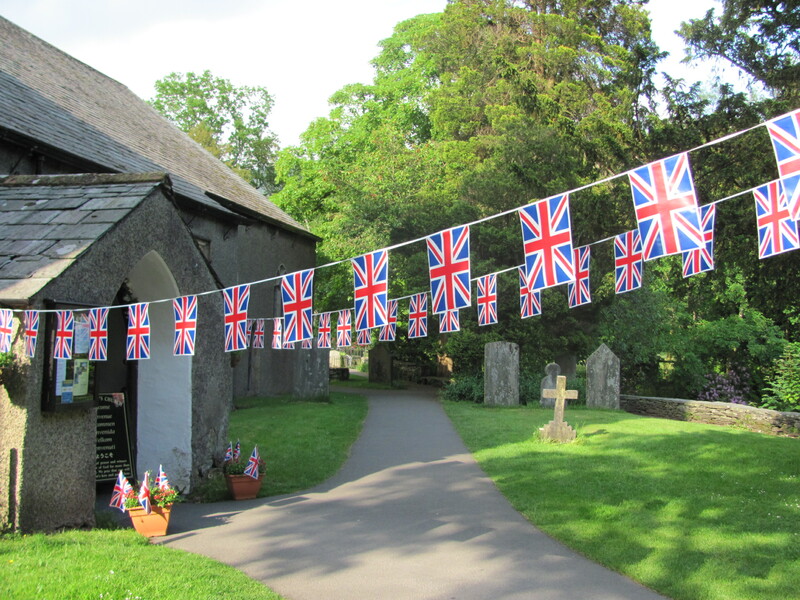 Situated in Grasmere, across from St.Oswald’s Churchyard is a very special place. In a row of 17th Century cottages is the home of Taffy Thomas MBE. One of the earliest occupants was a Richard Harrison who died in 1662. 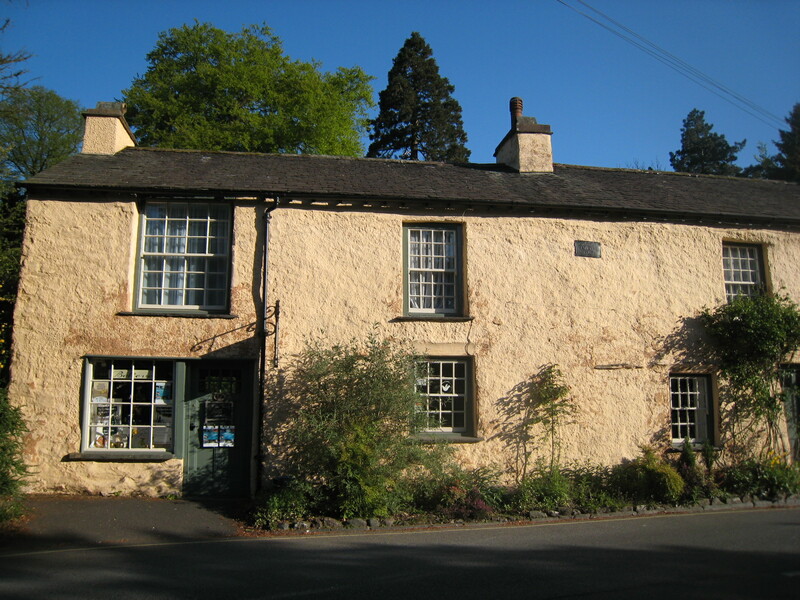 By the eighteenth century it had become Robert Newton’s Inn and William Wordsworth, his brother John and Coleridge stayed here for several days during their tour of the Lake District in 1797. 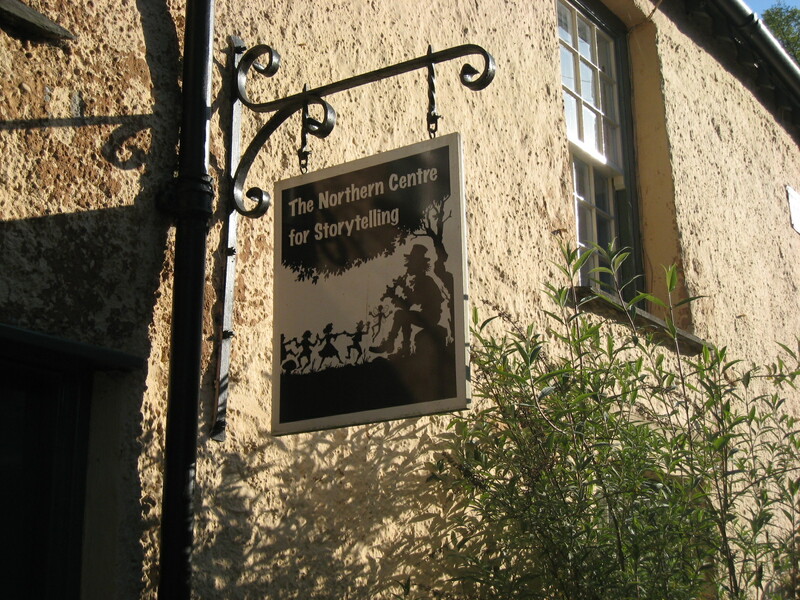 Now it is the home of The Northern Centre for Storytelling. Tales in Trust is a resource for storytelling in the North of England. The Northern Centre for Storytelling. 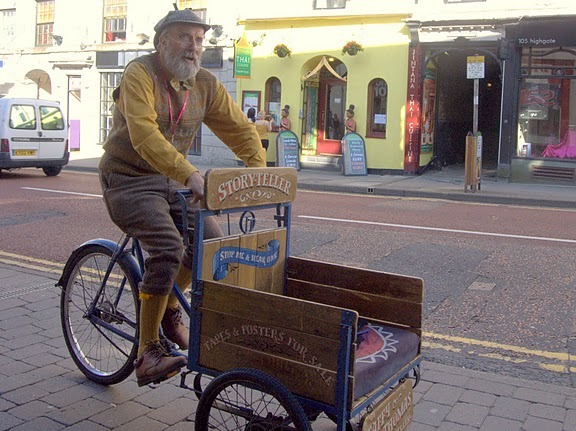 Taffy has always been a familiar character, in the old days he used to cycle round on his tricycle nowadays he has a wonderful minibus called Betsy II. Always with a story or a riddle to tell, he is one of life’s real characters. Taffy Thomas. Photo by Steve Barber. 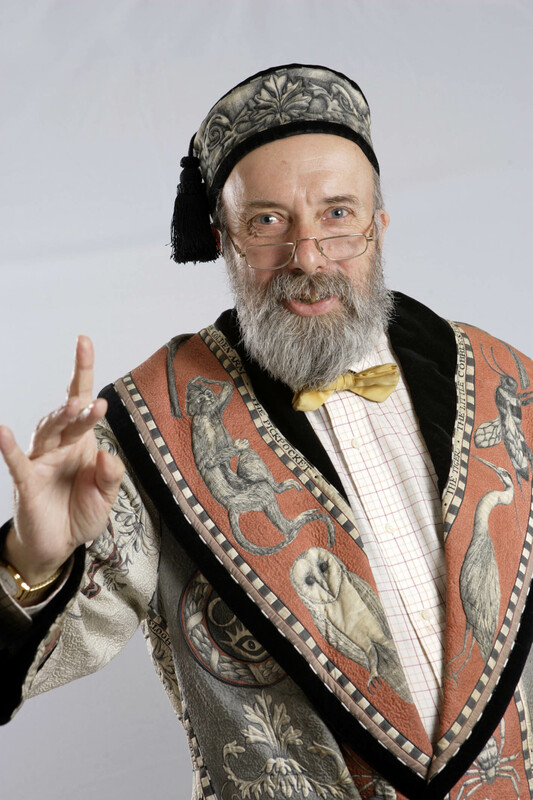 Taffy has given enjoyment to children and adults all over the world with his stories, and was recently given the amazing title of the first ever Laureate for Storytelling. Running for two years from Jan 2010 to Jan 2012 he is now truly a fine ambassador of storytelling. As Laureate he was given several gifts. These were:- 1Kg of dried beans, a simple compass, a packet of love hearts, a clear glass bottle, a tall white candle, a silver lucky charm bracelet, and a whistle. These have to be worked into stories during his time as Laureate. I look forward to hearing them. 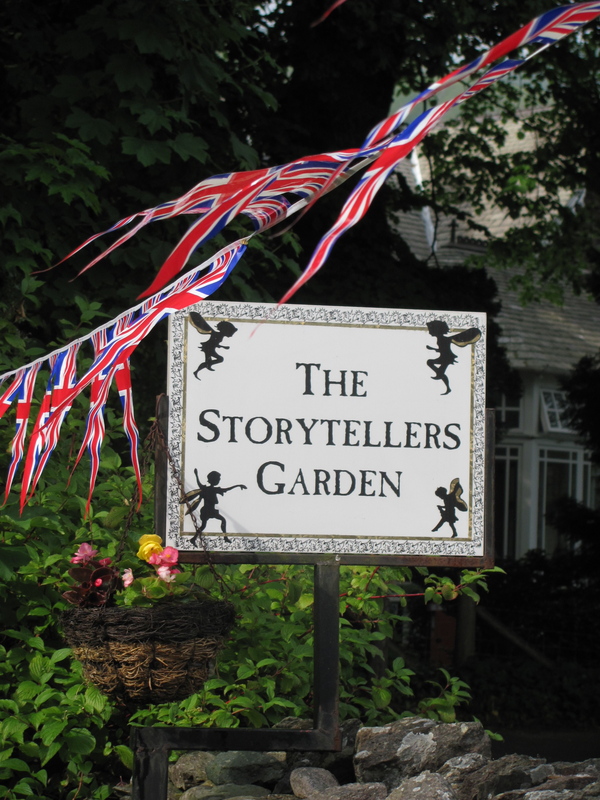 Situated next to the centre for storytelling is The Storytellers Garden. Many amazing tales have been told here, and every event always sells out fast. 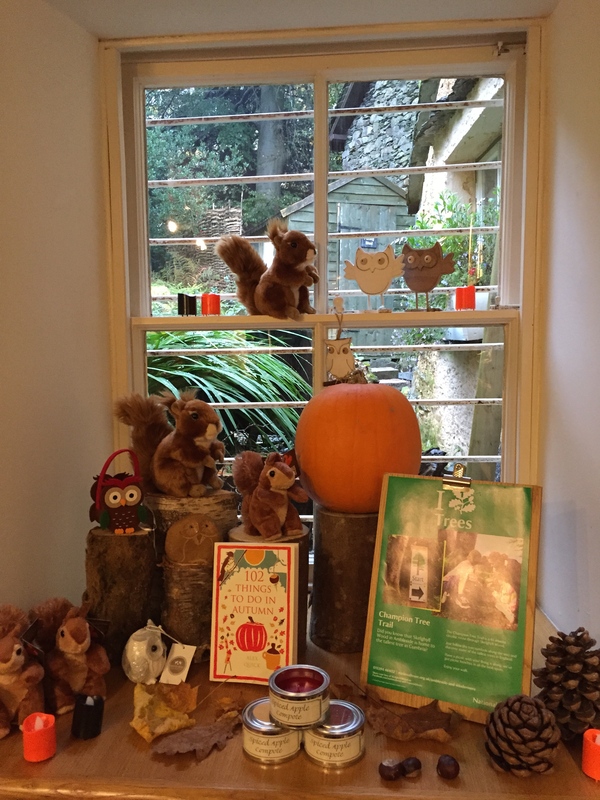 My favourite events are at Halloween and Christmas, both special times in the garden. In the photo you can see a brazier. Taffy used to love listening to Johnny Morris (of Animal Magic fame) who told tales over a brazier as The Hot Chestnut Man in the 1950’s. He was given permission to recreate this and as part of a Festival I used to help organise called Grasmere Festival of Stars, the Hot Chestnut Man was reborn on 26th November 2005. Taffy commissioned a blacksmith to make the brazier and chestnuts roasted while he told his tales. Taffy has an amazing coat. Called the storytelling coat it is a unique piece of textile art made by Paddy Killer. Point at something on the coat and Taffy will tell you a tale about it. Taffy is also involved in a monthly storytelling club at The Watermill Ings, where you can listen to stories and enjoy a pint. 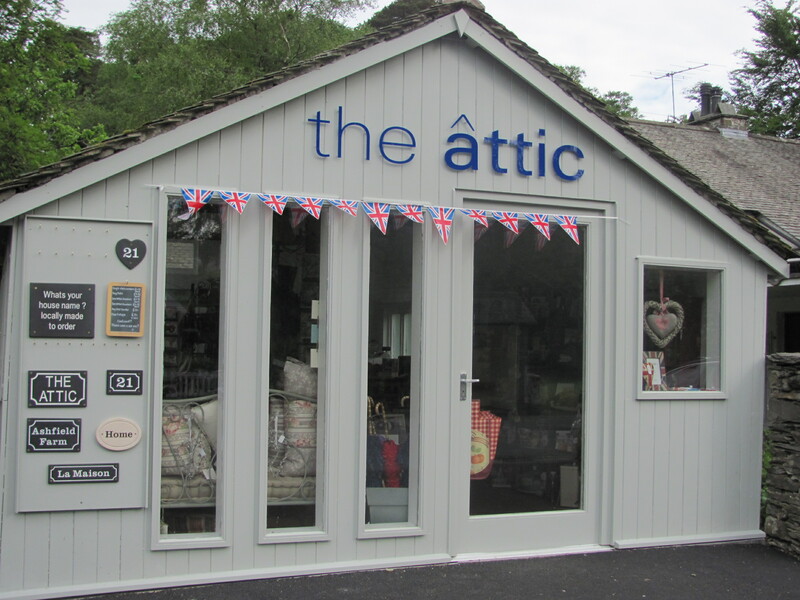 So the next time you are in Grasmere, look out for this sign. Who knows, Taffy might be in residence and tell you a story. 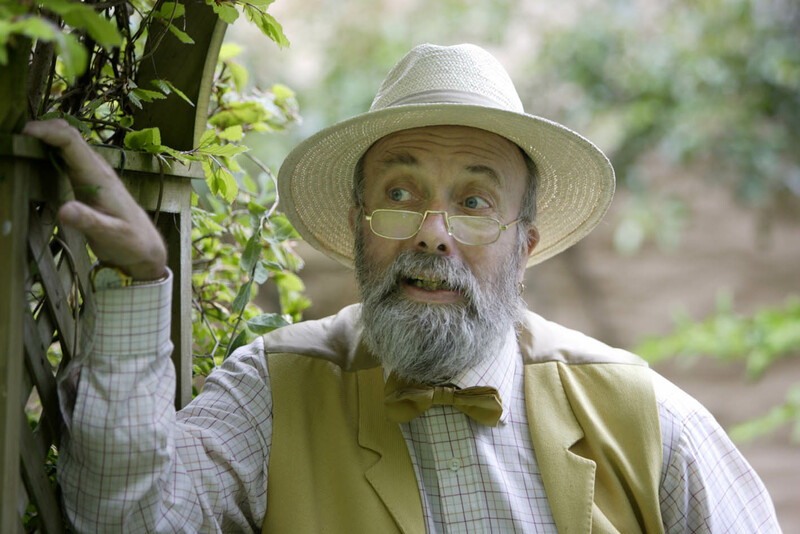 Taffy is now so busy now that he is Storyteller Laureate that he is travelling all over the Country (and further afield) telling his stories. 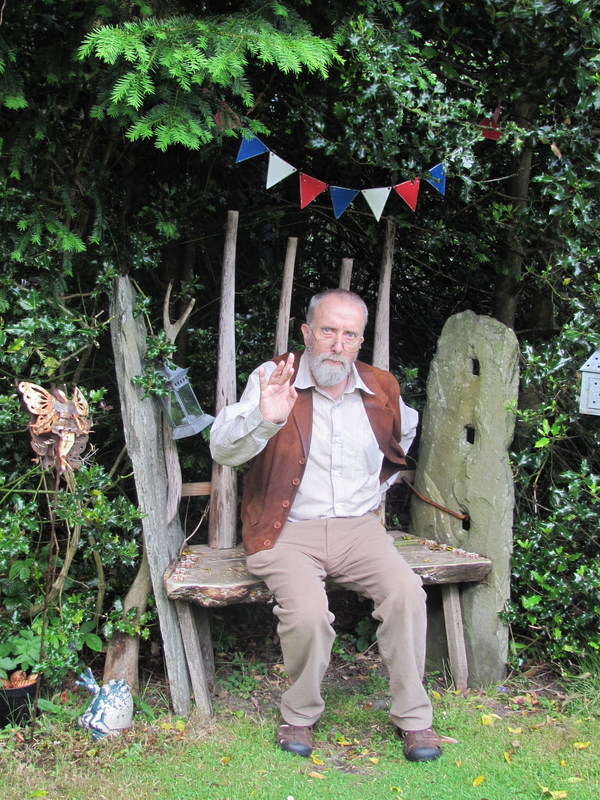 He is now situated at the end of he building at Church Stile beside his Storytellers Garden. The other part of the building is occupied by the National Trust Information Centre. 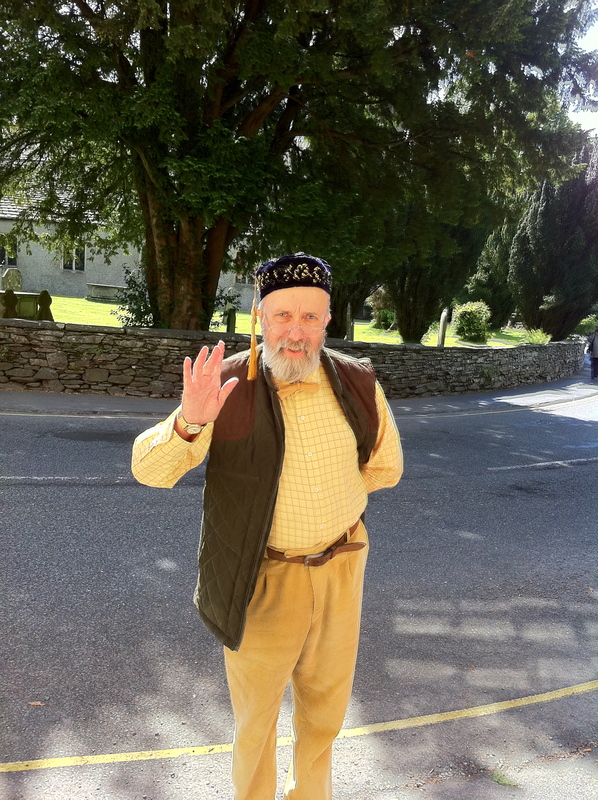 So far his year Taffy has been busy taking part in events for the Lake District Summer Music Festival, doing story walks around the village and is due to perform at the world famous Grasmere Sports at the end of August. He will also be doing his famous Halloween stories and Christmas events. 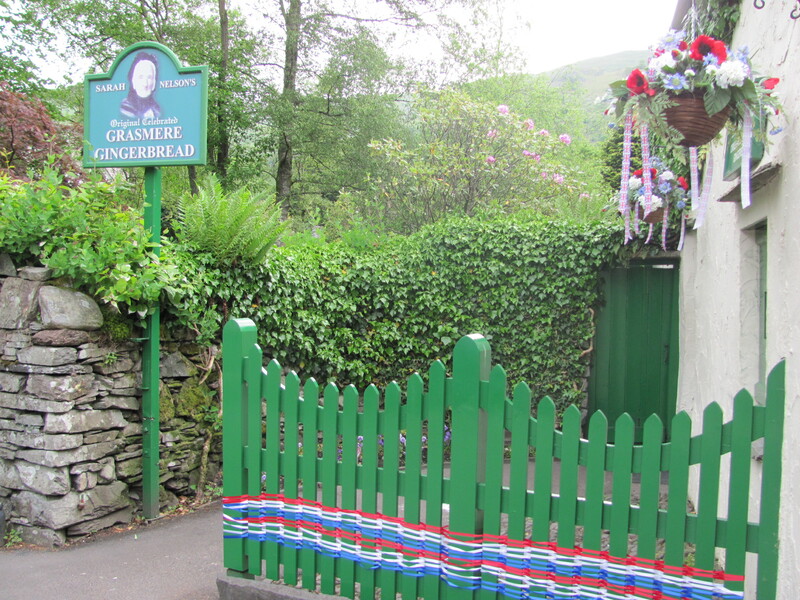 If visiting Grasmere, it is always worth giving him a phone on 015394 35641 to see if he will be in the village when you visit. 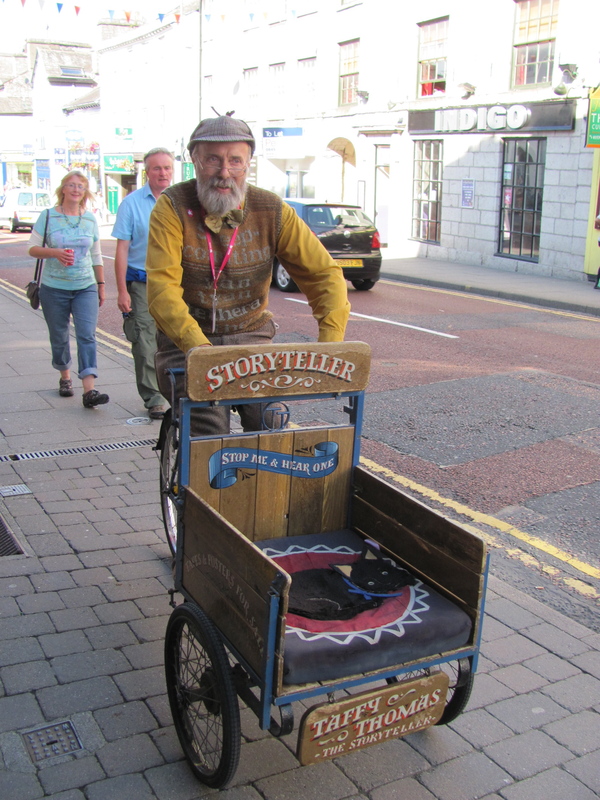 Caught up with Taffy at the Lakes Alive Event in Kendal and he had brought out his “stop me and tell one” cart for a final run. Taffy was often a familiar sight on the streets of Grasmere with his bike, so it was a pleasure to see him out and about on it again! One of the best things about living in the Lake District is that if you wake up early and it’s a nice day, you can fit in a walk before work. The mist was rising off the water when I arrived and there was not a sound other than the birds and sheep. Even the traffic on the main road hadn’t started yet. 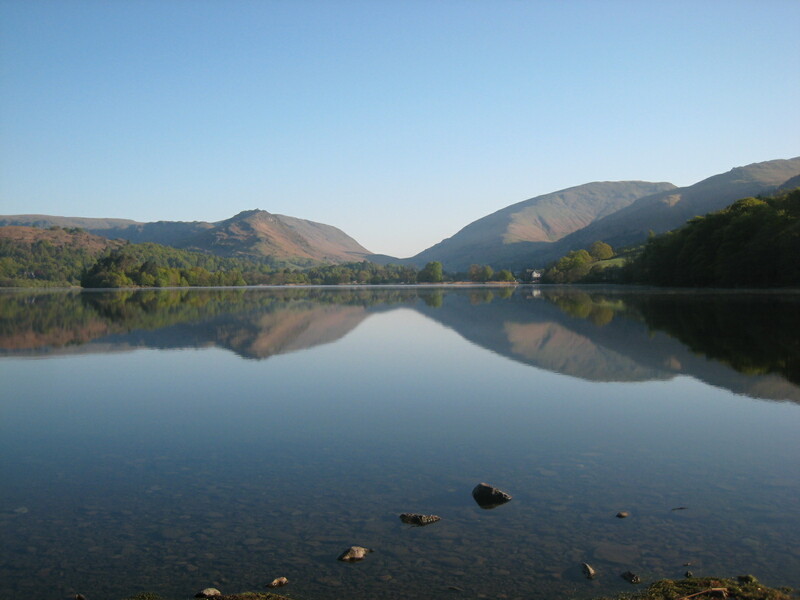 Species of birds ever-present on Grasmere include Black Headed Gull, Coot, Mallard, Mute Swan and Canada Geese. 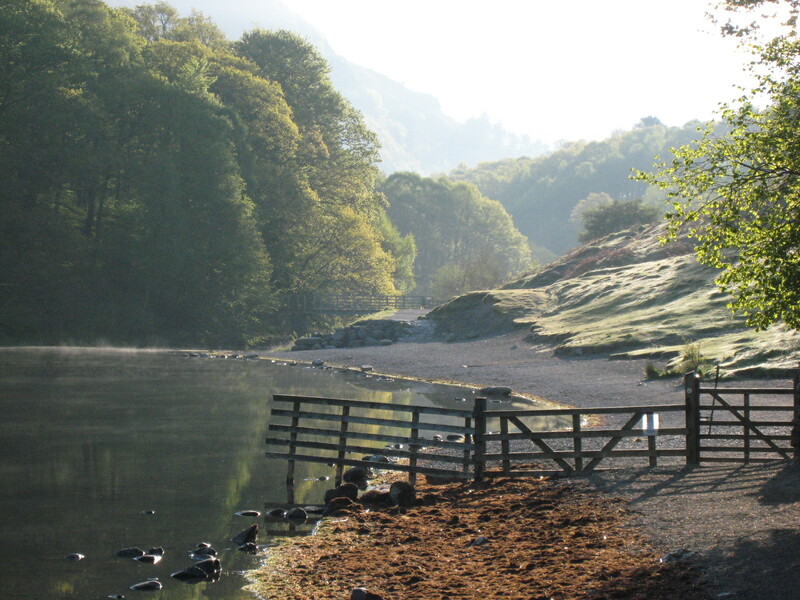 Many attempts have been made over the year to cull the Geese around Grasmere and Rydal Water, because they compete with sheep for grazing, but they continue to flourish. 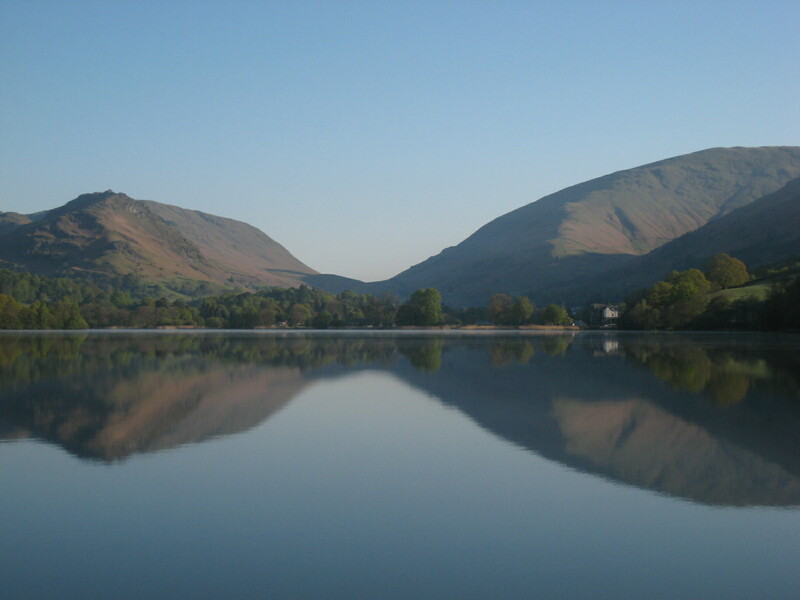 Helm Crag from Grasmere Lake. 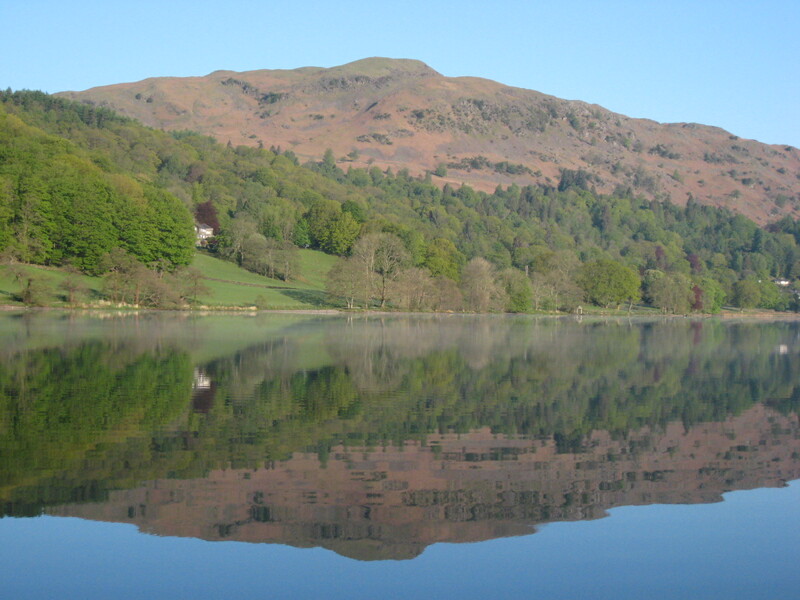 Several spellings of Grasmere can be found through the years. Gressimer,Grysmyre,Gressmere but the probable origin is Grisemere meaning “Lake of swine” . One of the early uses of the forest was the herding and pannage of pigs. Hard to believe such a stunning setting could be named after pigs!. I had approached the weir from “Penny Rock” a sharp corner on the road which opens out into a view the length of the lake, on the road from Ambleside to Grasmere. 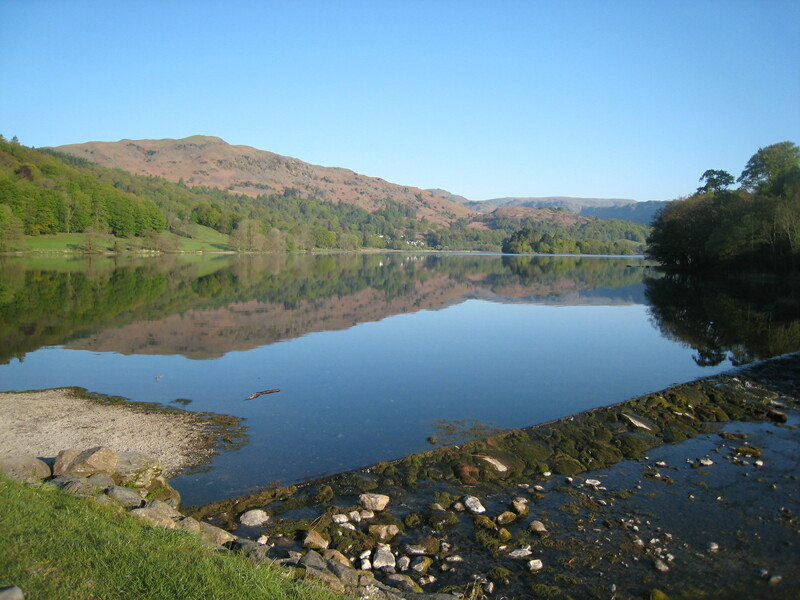 The turnpike road through Grasmere was made about 1770 although the road by Penny rock was not made until 1831. Having to blast through the rocks at this point was so expensive that it added a penny on to the rates, hence the name Penny rock. 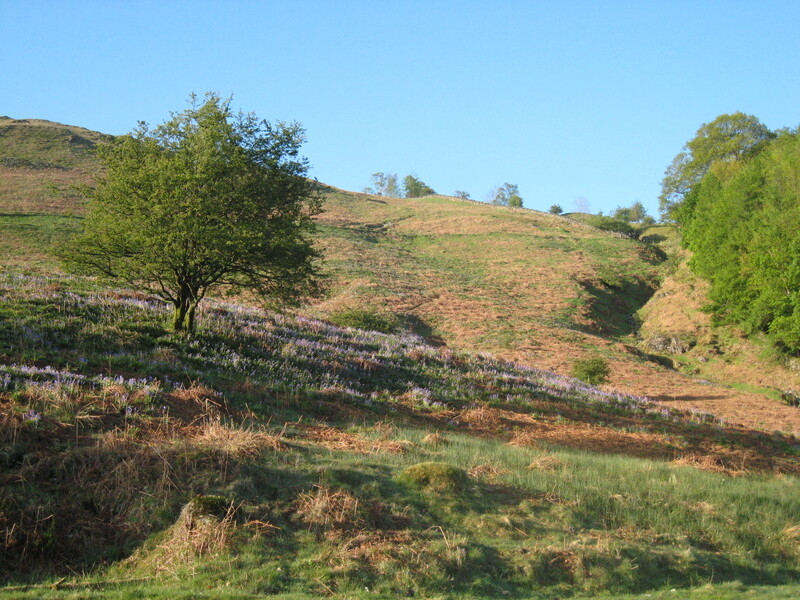 The hillside at the moment is tinged blue with all the bluebells, a wonderful sight. The reflections on the lake were beautiful this morning, I just missed a heron flying past in this shot, will have to be quicker off the mark in future. 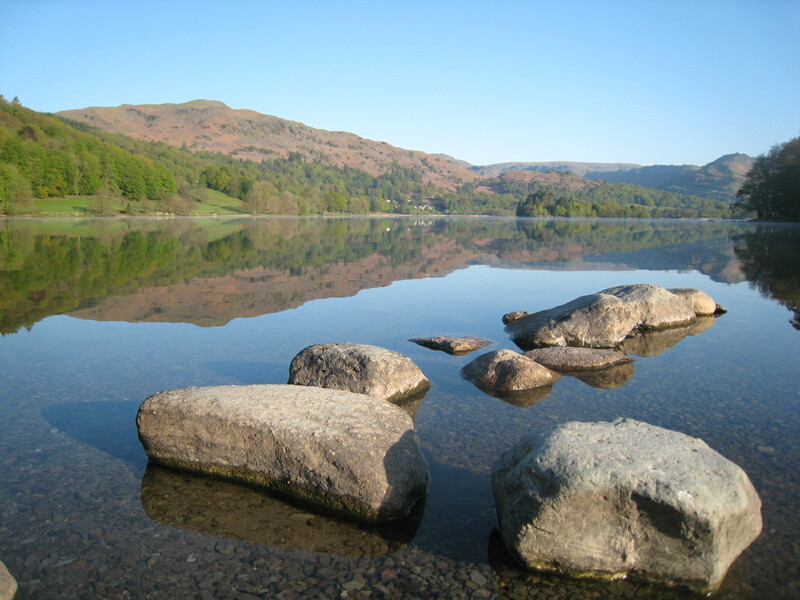 Some facts about Grasmere Lake. 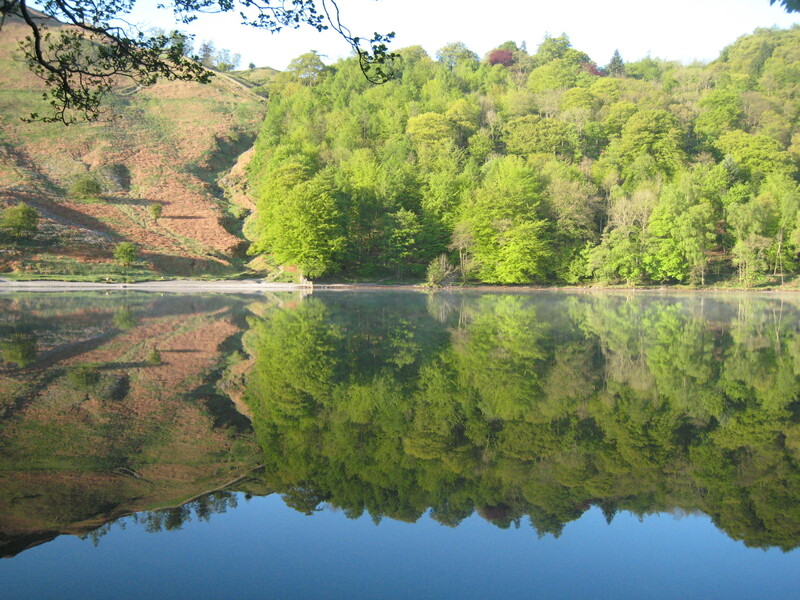 The lake is 1540 metres long, 640 metres wide and at it’s deepest 21 metres. The view above is looking in the direction of Deerbolts Wood and Silver Howe. Roe deer as the name suggests frequent the area. When they see you they head off up the fellside in leaps and bounds revealing their pale rump patches. Time was marching on, so work was calling, but what a lovely start to the day. Priceless.